Copyright 2018 by The Milton Garden Club. All Rights Reserved. Native Plants Rain Gardens, Composting, Conservation Native Bees Rain Barrels, etc. 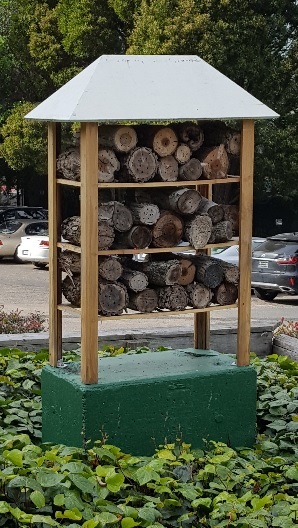 A native tunnel-nesting, solitary bee "condominium", at Claremont Club and Spa, Berkely, CA. This design served as the model for the Milton Garden Club's two bee condos at Trailside. Smart design: the logs are removable and discarded (AFTER the eggs, laid in drilled log-holes, develop and hatch) to maintain sanitation and bee health. We are grateful to Dr. Olsen, husband of a club member and a talented woodworker, for designing and constructing these structures for our Native Plant Garden.